Aberdeen-based scrap metal reprocessor and tubular steel trading company, John Lawrie Group was today presented with one of the UK's most prestigious business awards. Lord Lieutenant John Reynolds, presented John Lawrie Group's managing director, Vic Sinclair, with the Queen's Award for International Trade, won last year in recognition of the company's massive growth overseas. This was the first time that John Lawrie Group has applied for a Queen's Award, making the achievement particularly notable. Lord Lieutenant John Reynolds said: "I am delighted to be presenting the John Lawrie Group with this award, which recognises the company's successes abroad. "This accolade and the group's booming international trade really helps to put Aberdeen on the map, providing a boost for the area's general prosperity and enhancing the opportunities for increased business creation and development." 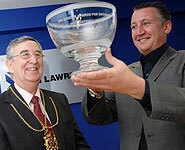 Commenting on the award, Vic Sinclair said: “We are very proud to have won this much coveted and prestigious award. All of our staff work extremely hard to ensure our success overseas, this award pays tribute to their efforts. John Lawrie, which employs around 100 staff throughout Scotland, the West Midlands and Houston, USA, has seen exports rise to around 80% of turnover, primarily in new and reusable steel products. Noting Spain, Portugal, France, Italy, Sweden and the USA among its main markets, John Lawrie Group achieved a turnover of £75 million last year.